The colours of the Tunisian Tigers of s.Pz.Abt.501 have been debated for years. New photos have resolved some of the questions. When the first Tigers were delivered to the unit, they were painted with a subtle camouflage pattern. Since this battalion was earmarked for African service, we must assume that the factory painted the tanks with an official "tropical" scheme. Otherwise the Tigers would have been dark grey. The German military instituted a "tropical" scheme in 1941, consisting of RAL8000 and RAL7008. These two colours had low contrast and are almost impossible to distinguish on B/W photographs. A second scheme was ordered in April of 1942, consisting of RAL8020, a light tan, overpainted with RAL 7027, a mid grey. This scheme had a higher contrast. 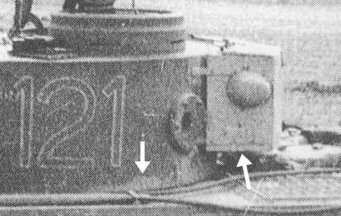 The fact that the 501's Tigers had a low-contrast scheme, combined with the examination of the Tiger at Bovington Museum by historians, suggests strongly that the Tiger factory used the first tropical scheme long after the second one was designed. Therefore this is the original colour scheme for the 501's Tigers. The battalion trained on these Tigers for weeks before shipping out to Africa. 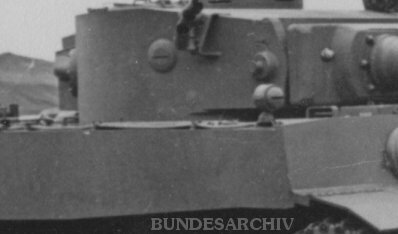 During this time, new equipment was designed for the Tiger and delivered to the battalion to be fitted. This included Feifel filters and large turret bins. Many photos of these Tigers show these items painted in a lighter colour than the rest of the tank. The simplest explanation is that the battalion, or the equipment manufacturers, were issued with the second set of "tropical" paints and used the base colour RAL 8020 on these items. We also see a light colour in areas of Tiger 112 that were damaged in battle and repaired. The gun sleeve seems to be completely light in colour, suggesting that it is a replacement. 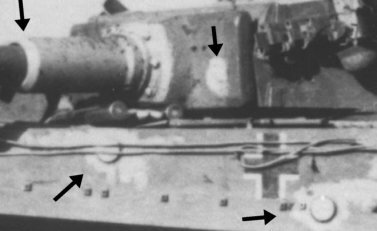 The gun barrel is darker than the rest of the tank, implying that it is a new barrel still in its factory grey varnish.